Yay, The Vamps… Yes, I’m middle-aged. I often need a nap in the afternoon, I have a lot of grey hairs (more than home hair-colouring can fix…), I forget where I put the hand towel when I come out of the bathroom and then realise it’s wrapped around my head, I lose my sunglasses then realise I’m wearing them, I get excited about ordering seeds for the garden each year… and don’t even start on what happens if I sneeze suddenly. But, I can still get down with the kids, or ‘wit the kidz, innit’… ‘cos I’m well trendy, know wot I mean? Sorry, I’ll stop trying to talk like young folk, as I haven’t got a clue what I’m talking about. 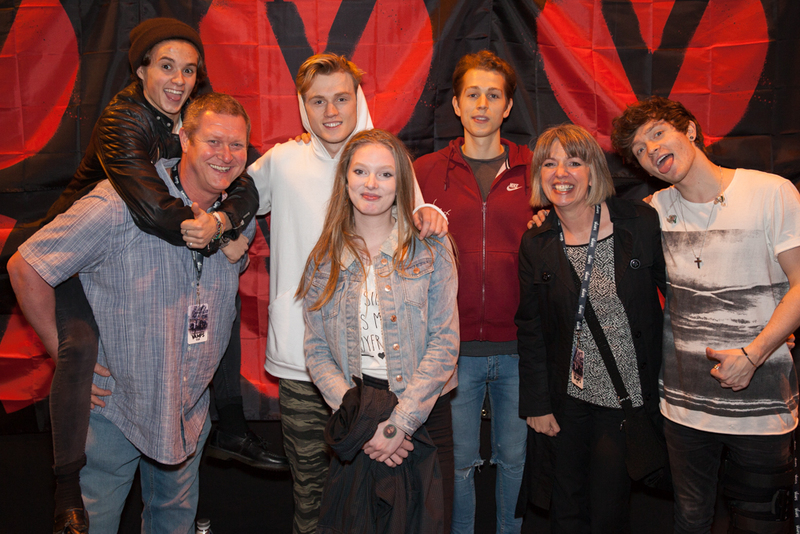 Here’s proof that I am young at heart – went to the Genting Arena on Saturday in Birmingham, and was lucky enough to meet the Vamps and get a photo. It was a Xmas pressie for our daughter who rather likes Brad and would like to have a date, sorry, ‘hang owt wit him’. Yes, I think my husband might have blown it for her by giving Brad a piggy back, but we got a bit over excited… mind you, as you’ll see, Connor has his hand on my shoulder which means we’re virtually related, he just doesn’t know it yet. If you get a chance, folks, go and see them. You won’t be disappointed.